Here it is! My street team, newsletter subscribers, and social media followers saw this last week, so now it’s time for the cover to go on the blog! 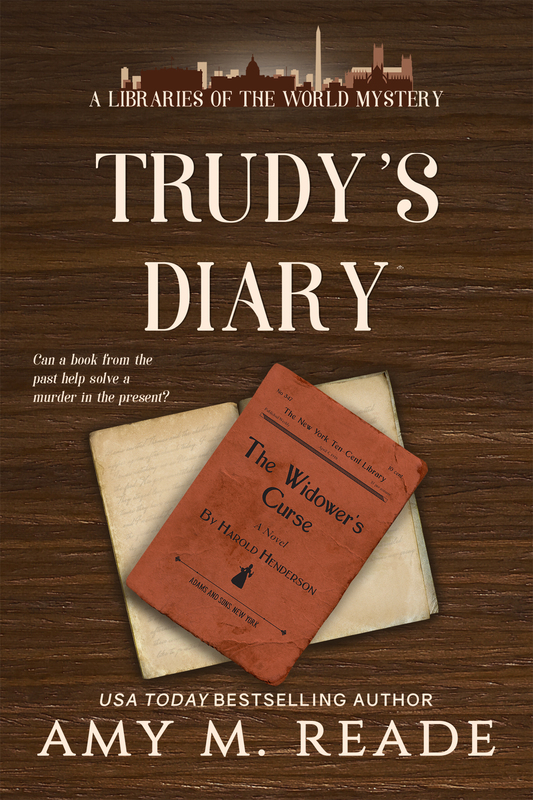 Introducing, Trudy’s Diary, Book One in the Libraries of the World Mystery Series! And when she comes across a diary and an old dime novel with suspiciously similar stories and unknown origins, she knows all the mysteries are somehow connected. Can she figure out the identity of the killer–or killers–before it’s too late? Trudy’s Diary is the first book in my new series featuring special collections from libraries all over the world. In this book, I’ve focused on the Library of Congress in Washington, DC, which seemed a fitting place to start. Book Two, which is in the works and currently does not have a working title, features the map collection at the main branch of the New York City Public Library. Book Three takes my readers over to England, but I’m not going to say any more about that just yet. I’ll let you know when it’s ready for pre-order! This entry was posted in Uncategorized and tagged contemporary mystery, diaries, dime novel collection, early American west history, historical mystery, libraries, library mysteries, Nebraska Territory, Northwest Territories. Check out this post from the Reade and Write blog introducing, Trudy’s Diary, Book One in the Libraries of the World Mystery Series by Amy M. Reade. Thanks for the reblog, Don! Much appreciated. Your new series sounds most interesting, Amy.